This new, reusable NEMA power distribution stringer (4B5-20) is ideally suited for arenas, stadiums, and other locations. Because the stringers are designed so that they can be reused from site, they present a cost-effective solution. The stringers feature solid Hypalon rubber molded construction with no voids or air-gaps. The assembly block is integrally molded to a heavy-duty SOW-A cable for long-lasting performance. Standard stringers are available in three to five block configurations. Each block consists of two NEMA 5-20 duplex receptacles with weather-tight covers installed. When GFCI receptacles are installed, the user is protected from line-to-ground electrical shock hazards. 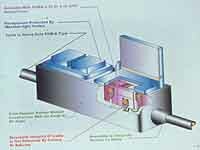 They are available in either single phase, 3-wire or three phase, 5-wire configuration, and are equipped with the appropriate 30-amp locking connectors factory installed on cable ends. Duraline, 75 Hoffman Lane, Central Islip, NY 11722. Tel: 631-234-2002; Fax: 631-234-2360.